When I walk around the neighborhood, I take my camera. If I don’t, I’m sure to see a roadrunner, hawk, or merlin. I don’t know if there is ONE best photography tip, but this one is on my short list: Be Ready. Ready means camera in hand, on, lens cap off. 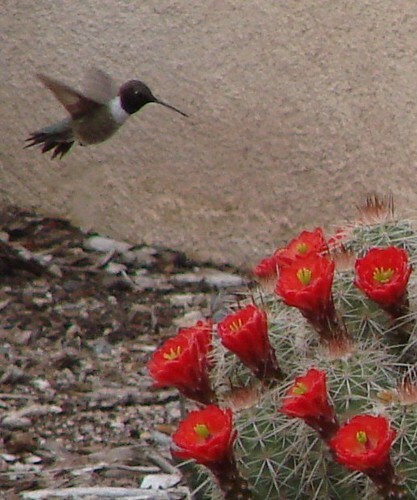 Four years ago tomorrow, I saw this hummingbird hovering just above a claret cup cactus, as I rounded a corner close to home. Imagine me standing in the middle of the street, stopping the dog in his tracks as I juggle leash and camera, frantic that I will miss this great shot, trying not to think of the cars that frequently roar around corners blindly. 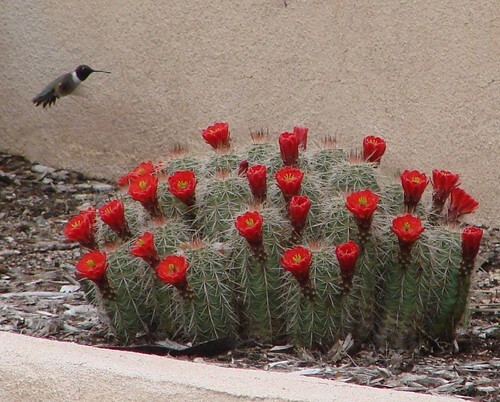 Fortunately for me, this was one patient hummingbird. PS: Now, I wear a carabiner to hold the leash, so both hands are free. And the dog has learned to stop on a dime. Luke is a good photo-dog, as was Lucky before him. Posted text and photos, including of a peregrine falcon, from a walk along the Rio Grande in Albuquerque, New Mexico. I go to Chaco Canyon every year (except for this one). In 2008, I also traveled to a couple of outliers west of Chaco. The road into Kin Bineola (“where the wind whirls,” Navajo) crosses a dirt dam. I had never seen any water on either side of that dam before, but on this trip in May, there was a small pond near the dam, well below the road. I saw something circle over the pond. I stopped on the dam to consider taking a picture. 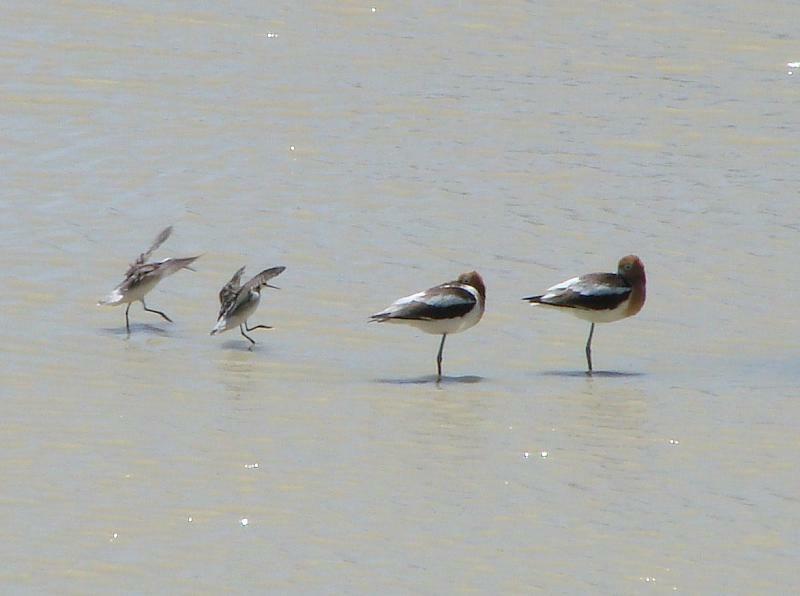 The two adult avocets were cute enough – and seemed out of place enough – to warrant a photo. I just got lucky that the babies flew in just as I clicked. I respect photographic skill, experience, and equipment, but lucky timing is the most valuable asset a photographer can’t buy. I never expected to photograph shorebirds in the desert. 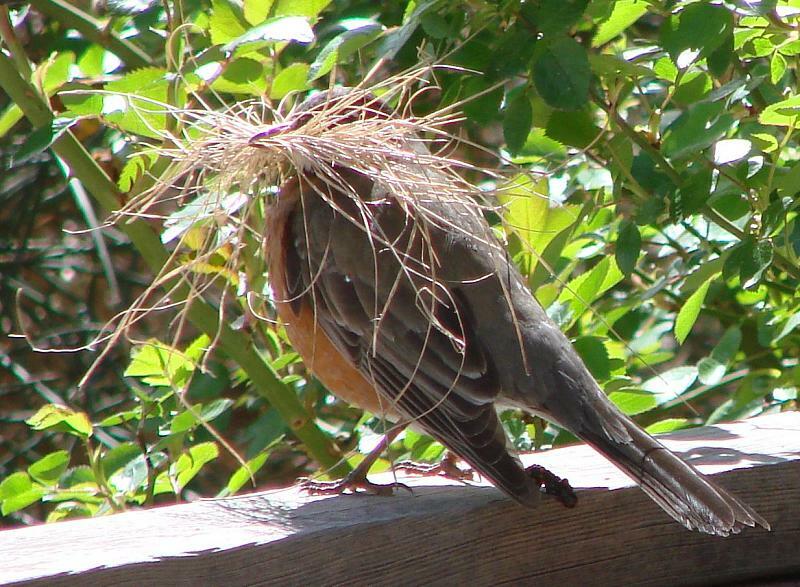 I watched this robin gather grass for nesting material in our small sideyard a few years ago. It was a windy day and the robin kept dropping what it already had in its beak as it tried for more. (Called to mind Aesop.) After numerous attempts, the robin gathered up a good bundle. It took off from the grass and paused just long enough in a gap in the fence. Click. Thank you. With all the wind, I didn’t expect this photo to be in focus. 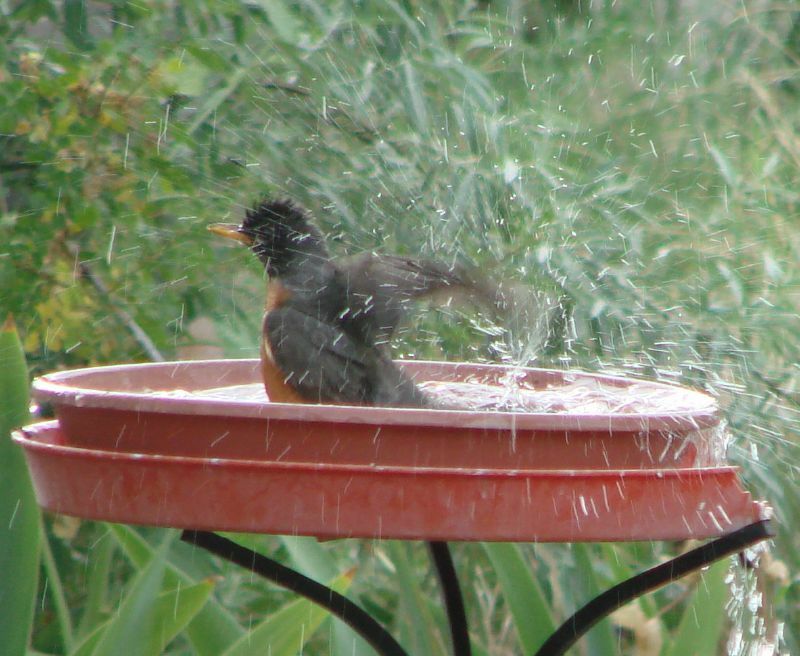 Robins love to bathe, perhaps moreso than any other birds I’ve seen in our yard.